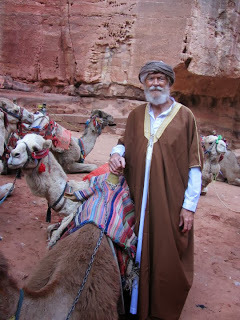 Here I am in the Ancient City of Petra, in Southern Jordan, with my trusty ship of the desert. Why am I posting this picture with the press release on a new quantum physics breakthrough? Do I have to have a reason? It's one of my favorite recent pictures. It proves that I get around, and anyway, all things are connected at the quantum level! Here's the press release as it is now. Erin Morgart, a writer/consultant for USA Today, is enthusiastic about getting into the paper soon. The groundbreaking Close-Neppe 9D spin derivation is supported by the latest ‘Quantum Jewel’ finding. The Close-Neppe Discovery represents a major realignment of Standard Physics with the broader Reality of human experience. In July, 2013, Edward R. Close and Vernon M. Neppe announced their discovery that there are actually nine finite dimensions 1, 3 “Our day-to-day experience is one of experiencing our physical reality—the length, breadth and height of objects. These three dimensions of Space change with every new moment in Time. These features reflect the first four dimensions. The idea that there are nine spinning dimensions means that much of our actual reality is hidden.” explained Dr Neppe. In summary, the 9 finite dimensions appear mathematically feasible, yet applying the math to any other dimensions, like the 10, 11 or 26 as in some String Theories, or the 4, as in our experience of our day-to-day reality, produces errors: TDVP scientifically and mathematically motivates multiple dimensions, and Close and Neppe show that there are likely 3 carefully defined dimensions each of Space, Time and Consciousness. For Close: “Mathematically, the spin is the key: These rotational movements—the ‘vortices’—allow a way to move through dimensions.” These scientists had to develop new mathematical techniques to derive their information: These include the ‘Calculus of Distinctions’ (the ‘Sparkling Diamond’) and ‘Dimensional Extrapolation’ 3. They also, of course, relied on already well-established conventional mathematical techniques to help in the exploration of the many ‘extra’ dimensions. The second major 2013 event in Mathematical Physics occurred in September. Quanta Magazine published an article “A Jewel at the Heart of Quantum Physics” 2. The author described how physicists, Nima Arkani-Hamed, Jaroslav Trnka at the Institute for Advanced Study, along with other collaborators, discovered a new technique for applying multidimensional mathematics and pointed to the relevance of spin by incorporating ‘twistors’ 2. Arkani-Hamed and collaborators discovered that particle interactions may be based on a multi-faceted geometric shape, the ‘amplituhedron’. This looks like a metaphorical intricate, multifaceted ‘jewel’ in higher dimensions, so much so that these scientists could be referred to as the ‘Jewel Scientists’. Their findings significantly simplify multidimensional math, and change ideas about space and time locality and the so-called ‘unitary elements’.2 Their general finding indirectly motivates the feasibility of more easily deriving multidimensional quantal particle structures, and would therefore indirectly support the earlier-announced more specific Close-Neppe discoveries1. Just as Close and Neppe had derived a 9-dimensional spin mathematical finding to explain elementary particles, the math of the Jewel scientists also negated the idea that all quantum physics could be conceptualized purely as properties of four-dimensional physicality: Both groups demonstrated mathematically that quantum physics simply cannot fit ‘locally’ into the geometric ‘unit’ that was previously regarded just as three dimensions of space and a moment in time. Instead, they supported the view that quantum realities can be simplified when conceptualizing new structures in higher dimensional realities, making calculations with the appropriate math much easier. We could predict that the two metaphoric findings of the ‘Jewel’ and the ‘Diamond’ may ultimately work synergistically with each other: Close and Neppe’s 9-dimensional spinning reality might be a specific applicable derivation of the mathematical applications of Arkani-Hamed and collaborators. But, even if that link were shown, in addition to the more obvious ostensible similarities such as the multidimensionality applying simplified math, there are some pivotal differences between these two momentous 2013 findings: It begins with a metaphorical ‘diamond’. · It reflects the most fundamental logical system to approach Reality. · It allows applications across different dimensions, recognizing the distinctions between our different kinds of experiences, and how the mathematics can be applied at different dimensional levels. · It allows conceptualizing conscious awareness, differentiating our experience at the most fundamental of levels, and ultimately realizing the relative nature of the hidden dimensional realities of existence. · The CoD distinguishes 'variables of extent, content and impact'. These are applied to ensure that the dimensional, the substantial and the influences on events or objects are differentiated: consciousness is a critical common element in all of these. · It recognizes the key experiential roles of subjective ‘perceptions’, ‘conceptions’ and ‘interpretations’: What to us is experience in everyday reality, may be quite different at, for example, the sixth and seventh dimensional domains. · The CoD also allows for integrating the complex algebras and multidimensional geometries. This is possibly its most practical use. The role of Consciousness has largely been ignored, despite Bell's theorem and the follow up work of Aspect and others in communication at a distance, the delayed choice experiments and the split screen work, all strongly motivating this. 3 “We realize that any term pertaining to ‘Consciousness’ evokes controversy. And many physicists interpret all this research as not involving any ‘consciousness’: An independent ‘consciousness’ simply does not fit into a physicalistic four dimensional paradigm. But the nine dimensional spin mathematics works when we apply consciousness in the equations, and we believe that there is solid scientific support based on research.3 In TDVP, we’ve motivated for Consciousness being its own substrate along with Space and Time. Applying it, allows its seamless application across not only the Physical, but the Biological, Psychological and, indeed, the Consciousness Sciences. Without it, we return back to a situation where even esteemed scientists, like Einstein, could not solve the multidimensionality problem. Adding consciousness fills the void that was missing.” Neppe added. Close carefully, but still excitedly, added to Neppe’s comment: “This change of perspective including ‘consciousness’ makes sense of many unexplained physical observations. Previously intractable mathematics now yields to simplified calculations that work and markedly change our view of higher dimensional existence: In this new kind of Particle Physics, a key concept that I have just discovered (October 2013) is what we’re calling the ‘Triadic Rotational Units of Equivalence’(TRUE). This is allocated to elementary particles in the chemical elements of the Periodic Table, and by logical extension to molecules. We propose that this may offer a new understanding of the fundamentals of reality, and based on our preliminary findings, even, possibly, of life,” This new research is still in process, but is a logical continuation of the 9D thought experiment. These findings are still being checked; if shown to be correct, they are extraordinarily exciting in their implications for Space, Time and Consciousness. Natural imperfection: Symmetry or asymmetry in our cosmos? 3. Neppe, Vernon M. and Close, Edward R., Reality begins with consciousness: a paradigm shift that works. Fourth ed. 2013, Seattle: Brainvoyage.com. 4. Triadic Dimensional Distinction Vortical Paradigm (TDVP). See refs 1 and 3.